VyprVPN is a lightweight application that will help you configure and manage your VyprVPN connections. The application allows you to access VyprVPN from your system's notification area and easily switch between your server locations with just a mouse click. VyprVPN is able to easily encrypt your Internet connection in order to secure all your important data. The VPN connection can be effortlessly connected and disconnected with only a few mouse clicks. moreover, you can select your VPN server in an instant thanks to the fact that VyprVPN for Windows contains all the VyprVPN server locations. The program lets you choose from more than 50 server locations across the Globe with a single click. VyprVPN includes a speed graph feature which enables you to permanently keep track of your connection speed. Upload and download speeds can be easily viewed even if VyprVPN is disabled. In addition, the ping test function allows you to easily discover the fastest server available. - the capability to detect lost VPN connections automatically. 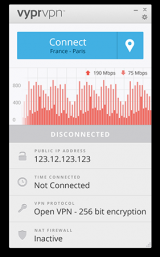 - easier and faster access to recent VPN protocols and server locations. - automatic updates when a new server location is available. - auto-connect function on mobile and Wi-Fi networks. Allows you to constantly monitor your connection speed. Provides a wide variety of powerful features and functions. VyprVPN has been tested by Download82.com team against viruses, spyware, adware, trojan, backdoors and was found to be 100% clean. Our editors will recheck this software periodically to assure that it remains clean.